In the process leading to the 2016 Foreign NGO and 2016 China Charity laws, a lot of the articles were focused on the macro issues of what this meant for the development of civil society in China. On the ground though, the questions were more practical, with the most recent being focused on donating money to China as a foreign foundation. Nearly six months into the process, as the impact of these new regulations to local and foreign non-profit organizations is being better understood, so is the impact of those who wish to donate money to these organizations. 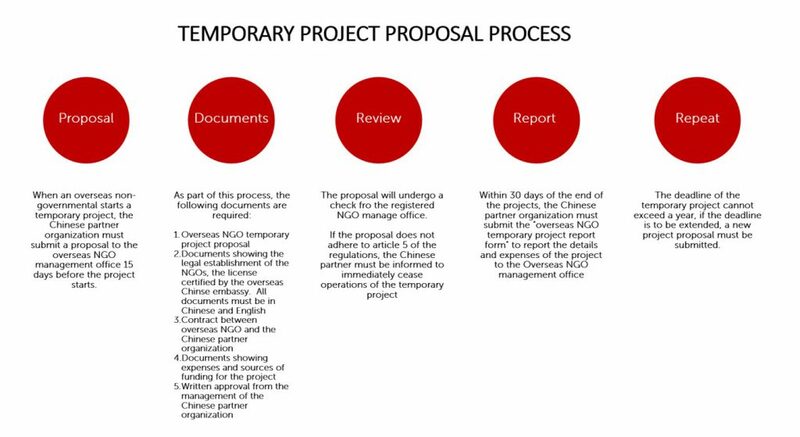 Looking at the process that has been laid out below, the first thing that we want to point out is that this process is one that the NGO itself must go through, and that while there are a couple of required elements that the NGO will need as part of this process, the screening process is not focused on the donor itself. Which is to say, that the current process is far more interested in where the money is going than where it comes from, but that those who are donating money are being asked to provide more information and assurances about the purposes of the money than before. We are starting with this group because it is the easiest. In fact, best we can tell at this point there is very little impact to this category of donor as the money is either coming from local sources or sources that would be considered commercial. For local donors, for as long as the donor is willing to treat this donation as a service agreement, firms would only need to ensure that the NGO (programs) they want to fund are above board and are able to supply the required invoice. For donors that are looking to transfer money from abroad, the one change that may need to be considered is the VAT that would need to be paid. For multinational firms supporting local CSR programs and partnerships, the role of the global foundation has been the core for many years., often serving as the funding arm for employee-led initiatives, yearly volunteer events, or disaster response, before this law was passed they were often able to transfer funding to their partners direct without much interference. Then, their partner, would work with the bank to complete the necessary paperwork, convert the donation to RMB, and then proceed with the program. Through the introduction of these new laws, that process has changed quite a bit. While not overly onerous, there are now a number of steps that the NGO must go through in order to legally receive these funds, with the newly created NGO Management Offices being responsible for over site. Of these steps, the one that donors need to pay attention to are the ones where a “certification” needs to be provided. A certification that can only be given by the Chinese embassy (or consulate) within the country of Foundation’s origin, and (as we are being told) may require the executive leadership of the foundation to make a personal appearance for. For firms that are using organizations like CAF, Global Giving, or the United Way, the challenges above are potentially more challenging depending on the legal status of the organization that you are using as a conduit for the donation. To date, as best we understand through conversations, only the United Way and Give2Asia have partnerships in place to potentially facilitate these donations, but there is still uncertainty for both. For Global Giving and CAF, neither have a registered office in the country, which means that their activities COULD be impacted in the short term… until they have developed their process. Again, a little more complicated. Given the new levels of management and oversight of organizations and donations, we offer the following tips for overseas corporation foundations who are looking to continue supporting their local CSR programs with the minimal amount of risk or paperwork. Plan ahead! Given the fact that your organization’s leadership may need to make a visit to a Chinese consulate/ embassy as part of the certification, an additional buffer of time needs to be planned for. Make sure that your NGO partners, local or foreign, are fully registered, and if possible, try to work with those that have gone through the process with other donors. Have a clear paper trail that includes the project overview, involvement of company, and budget. Make sure that the programs that you are funding are in line with the scope of service that they have been approved for. If donating the money direct, budget the time required to get the necessary stamps and certificates in place so that the local NGO can then register the project and receive the funding. If using third party agencies like United Way, CAF, Global Giving, ensure that they have a license to operate and have full authorization to re-grant overseas funds into China. Longer term though, and assuming the same barriers remain in place, overseas foundations need to assess how they will proceed under these new rules, with the possibility of establishing new partnerships or governance structures inside China as part of a plan to localized operations. For many firms in China, CSR and philanthropy, decisions and funding mechanisms have already been localized, and to date, this appears to insulate the firm (and its partner) from some of the more difficult paperwork and processes. However, knowing that many firms have a history of governance and centralized control when it comes to philanthropic donations, this may not be the best direction for everyone.